> Oath > Are you positive audiences are making favorable associations with your brand? As a marketer in today’s world, the content that appears next to your digital ads is just as important as the content you put in the ads themselves. Consumers make snap judgments about your brand based on adjacency, and over two-thirds of your audience will feel less favorably toward you if you’re placed next to untrustworthy, offensive, or low-quality content. 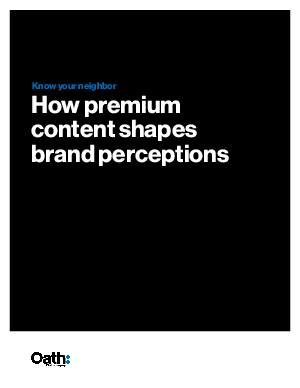 Fortunately for brands the flip side is also true, which is why it’s imperative that you guarantee ad placements that share digital space with premium content. With Oath’s reputation as a trusted publisher, brands can experience peace of mind knowing their consumers will make positive associations that will increase brand loyalty and love.